VIENNA – Iran and world powers made progress on future sanctions relief for Iran in marathon nuclear talks on Saturday, but remained divided on issues such as lifting United Nations sanctions and the development of advanced centrifuges. Diplomats close to the negotiations said they had tentative agreement on a mechanism for suspending U.S. and European Union sanctions on Iran. But the six powers had yet to agree on a United Nations Security Council resolution that would lift U.N. sanctions and establish a means of re-imposing them in case of Iranian non-compliance with a future agreement. Senior Iranian and Western diplomats echoed the remarks. Some of the toughest disputes, including the question of easing U.N. sanctions, were likely to be left for foreign ministers when they arrived in the Austrian capital on Sunday, officials said. “Even if and when issues get resolved at an experts level, there will remain some open issues that can only be decided by ministers,” a senior U.S. official told reporters. Iran is in talks with the United States, Britain, China, France, Germany and Russia on an agreement to curtail its nuclear program for at least a decade in exchange for relief from economic sanctions. The negotiators missed a June 30 deadline for a final agreement, but have given themselves until July 7. Foreign ministers not in Vienna are expected to rejoin their counterparts in a final push for a deal beginning on Sunday. Iran issued a warning about consequences of a collapse in the talks. “The other side has tried all kinds of pressure against Iran and if it intends to test these pressures again, as (President Hassan) Rouhani has said, Iran’s response would be actions harder than what the other side imagines,” said Iran’s nuclear spokesman Behrouz Kamalvandi, quoted by Iranian news agencies. All sides say a deal is within reach. But there are other sticking points in addition to sanctions and future monitoring mechanisms. One is a stalled U.N. investigation into the possible military dimensions of past Iranian nuclear research suspected of being linked to weapons development. Another is Iran’s demand to continue research and development work on advanced centrifuges, machines that purify uranium for use as fuel in power plants or weapons. U.N. International Atomic Energy Agency director-general Yukiya Amano on Saturday said he could issue a report on its investigation into past Iranian research suspected of being linked to nuclear weapons development by the end of the year if Tehran cooperated. “With cooperation from Iran, I think we can issue a report by the end of the year on the assessment of the clarification of the issues related to the possible military dimensions,” he said ahead of meetings with some members of the six-power group. Answering the IAEA’s so-far unresolved questions about the “possible military dimensions” (PMD) of past Iranian nuclear research will be a condition for easing some sanctions on Iran if Tehran and the six powers succeed in agreeing on a nuclear accord in Vienna, diplomats close to the talks say. Amano was in Tehran on Thursday for meetings with Rouhani and other top Iranian officials to discuss the stalled IAEA investigation into Tehran’s past nuclear work. He said that during his trip progress had been made in moving his investigation forward but more work would be needed, echoing a statement the IAEA issued on Friday. U.S. Secretary of State John Kerry, Iranian Foreign Minister Mohammad Javad Zarif and Chinese Foreign Minister Wang Yi have remained in Vienna. Senior officials from Iran and the six powers have continued meeting to try to finalize an agreement. 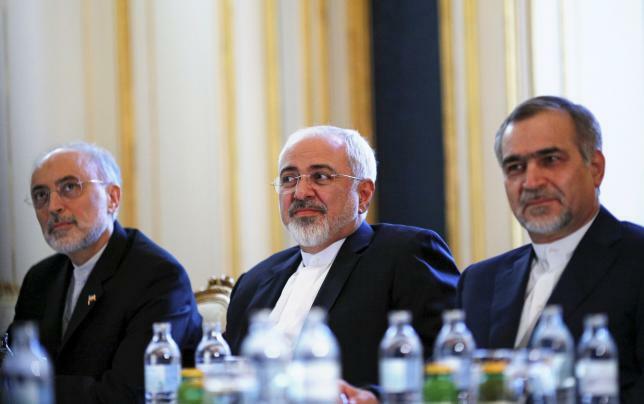 Kerry and Zarif met twice on Saturday, U.S. officials said. Western and Iranian officials said there were signs of a compromise emerging on one of the major sticking points: access to Iranian sites to monitor compliance with a future agreement. Another potential emerging compromise relates to Iran’s stockpile of low-enriched uranium. Western and Iranian diplomats said Tehran was considering shipping most of the stockpile out of the country, something Tehran had previously ruled out. Regarding the PMD issue, Western diplomats said they were not demanding a public confession that Iran had conducted research into building a nuclear warhead, but that the IAEA had to be satisfied it knew the full scope of past Iranian activity to establish a credible basis for future monitoring.